Mon., Oct. 3, 2016, 6:07 p.m. Both candidates vying to replace Rep. Kevin Parker as 6th Congressional district representative emphasize the importance of fully funding basic education in Washington, which will be one of the biggest and most expensive items on next year’s legislative menu. 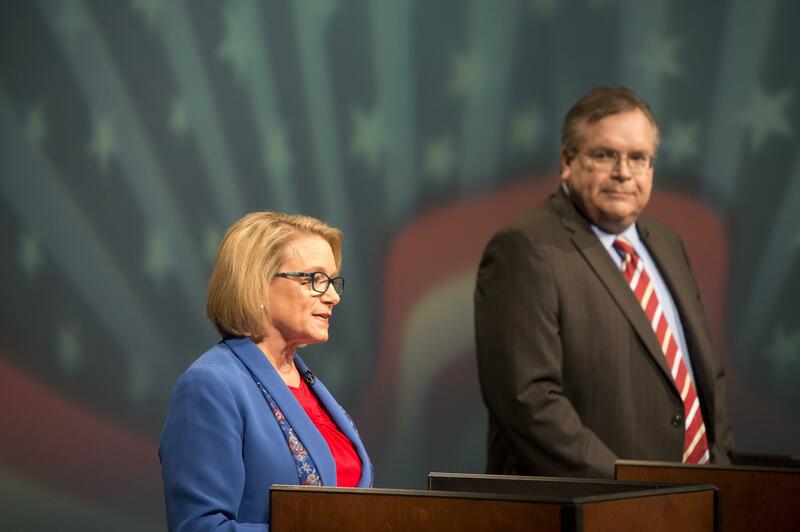 They’d go about it differently, however, the candidates said at a KSPS debate filmed Monday. Democrat Lynnette Vehrs, a retired nurse, advocated changing the tax structure, potentially implementing a capital gains tax. Republican Mike Volz, Spokane County’s chief deputy treasurer, said he would try to cut funding to the state’s regulatory agencies, specifically the Department of Labor and Industries. Vehrs said she would focus on improving safety and services in the medical field, something she criticized Parker for not following through on. Additionally, voters in the district have expressed concerns about the affordability and accessibility of health care, she said. “I would be very focused on health care and all things having to do with health,” she said. Volz said he represents a continuation of Parker’s eight years in office. “As far as particular policy issues that I disagreed with him on, I really can’t think of any at this time,” Volz said. Monday’s debate also touched on problems in the state’s foster care system, mental health funding and how to best attract business to Spokane, among other things. Responding to a question about Spokane’s business climate Volz criticized the state’s business and occupation tax, saying it drives businesses to Idaho. Vehrs countered that businesses may move to Idaho, but Washington’s tax-supported infrastructure likely means employees would stay put on the west side of the state line. Vehrs and Volz both believe Washington’s mental health system needs reform. Volz said he would encourage the involvement of more nonprofits in working with patients. Vehrs emphasized the importance of hiring more staff, and increasing funding for Western State Hospital and Eastern State Hospital. In their closing statements both candidates acknowledged challenges facing the state and the 6th District specifically. “We need to focus on strengthening our community and getting people to work, getting people paid at an appropriate level,” Volz said. As of Monday, Volz had raised $39,080 while Vehrs had raised $77,609.79. In August’s primary Vehrs won 44 percent of the vote while Volz won 29 percent. Editor’s note: Spokesman-Review reporter Eli Francovich participated in the debate as one of the panelists questioning the candidates. Correction: This story originally misnamed the state’s business and occupation tax. The story has been corrected. Published: Oct. 3, 2016, 6:07 p.m.